It's 2073 in Pittsburgh. Three years have passed since missiles hit the city, destroying it. A group of people from the university survived by hiding in a fallout shelter belonging to Helmsby’s Genetic Research Center. There they stayed for two years until supplies ran low and they ventured out into the streets. They quickly found they were not alone. The city was also now inhabited by shape-shifters ~ animals that shift into the form of violent creatures that thirst for human blood. Leonard D. Hilley II brings us into this dystopian world in his sci-fi thriller, Predators of Darkness: Aftermath. The survivors have been living completely inside since the creatures violently killed some of them. Just two men, Daniel and Lucas, venture outside of the Research Center regularly to forage for food and supplies in abandoned stores and buildings. Daniel's latest trip has led him to a discovery that makes him question what really happened those three years ago. Who really sent the missiles, and where did the shifters come from? Hilley makes this world come alive in the reader's mind. I have vivid images of the streets, the creatures and the characters we encounter throughout the story. There is plenty of action, suspense and drama to keep the pages turning from the first to the last. The characters are all very well developed, realistic (except perhaps for the shape-shifters) and unique. And like any good first-in-a-series book, the story leaves you hanging just enough to make you long for the next book. 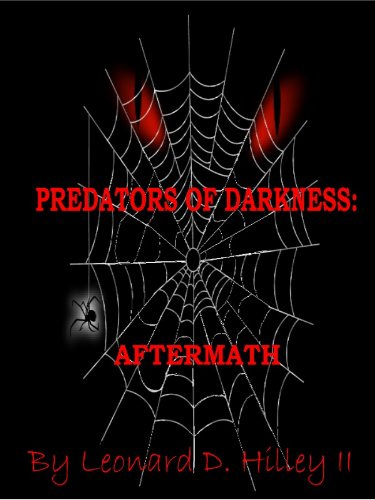 I loved Predators of Darkness: Aftermath. I'd say it's one of my favorite books of the year so far. I highly recommend it to anyone who enjoys sci-fi, distopian novels ~ as long as you're okay with a bit of gruesome violence at times. I have the next two in the series and will definitely be reading and reviewing them soon! 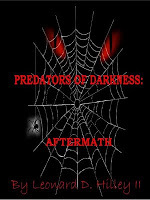 This review was written based on an ebook copy of Predators of Darkness: Aftermath that I received from the author in exchange for an honest review.